211 acres, established in 2016, 85 varieties of fruit, 200 hazelnut trees and year round vegetable growing . Helen Atthowe and Carl Rosato are developing an almost closed loop farming system using chopped hay from some fields to fertilize vegetable and fruit fields. Orchard ground cover is mowed close to the trees and let go in the row middles creating wonderful beneficial habitat. Grass mulch is used to smother ground cover and is then strip tilled leaving living mulch paths to increase beneficial habitat and to also increase overall fertility. Growing our diet using a plant based soil fertility system. First apples from trees planted in 2016. Wild apricots that grow on the ditch banks are great for eating and processing. These were planted as seeds in the fall of 2016 and will be thinned to 2 feet apart to make a 300 foot long hedgerow of apricots. A 8 to 12 inch round pile of hay mulch is used to smother the grasses for 6 to 10 months before the orchard trees are planted. Fall colors in the front yard! Established in 1980 and then sold in 2015 to Peach Jamboree. Danny Lazzarini and Andrew Seidman continue the eco-organic farming system that was established at Woodleaf Farm. 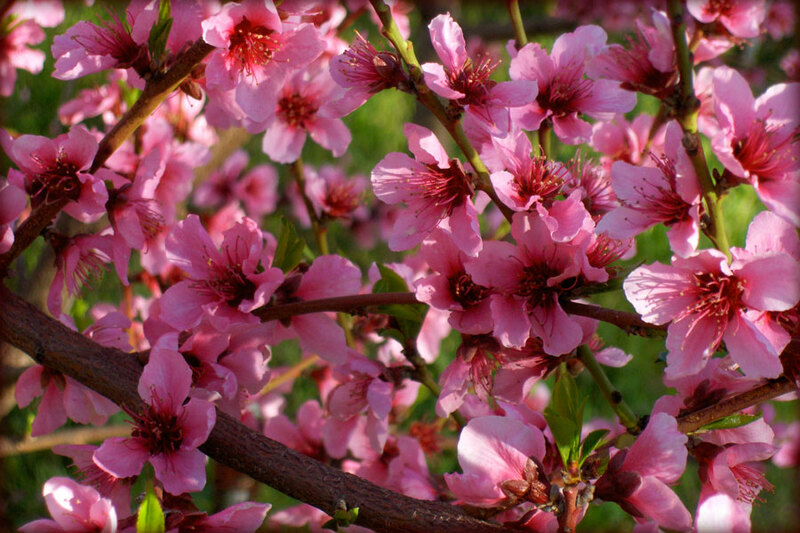 The farm produces nearly 200 varieties of peaches, apples, pears and cherries all selectively chosen for their ability to produce excellent fruit in this Mediterranean climate. Additionally, the farm grows an abundance of figs, persimmons, kiwis, blueberries and citrus. Woodleaf farm has been certified organic for over 36 years. The farm is 26 acres of native oak/pine forest. There are 8 acres of mixed fruit and vegetable production for farmers’ market sales. Soil tests, taken yearly for 30 years, track the rising soil fertility, with organic matter levels climbing from lows of 2 – 3% in the 1980s to 4 – 6% in the 2000s. Soil nutrient balancing and reduced tillage is the major focus at Woodleaf farm. Carl believes that fertile soil is a mixture of well-balanced minerals, high organic matter, good aeration and bountiful soil life. “It is crucial to leave the soil as undisturbed as possible. Tending soil for optimum production means adding minerals and compost every year. Compost made from branches, leaves and plant residues without manures are best for orchards since this best supports fungal growth. Too much compost in the soil is hard for the soil to break down quickly and will temporarily tie up nutrients”. Hence Carl applies yard waste compost 2 to 4 times a year at 2 tons per acre. Carl monitors and bases his amendment inputs on macronutrient, base saturation, and micronutrient balance. Insect and disease damage has decreased over the past 30 years and Carl attributes this to his nutrient balancing program, ground cover/living mulch management, reduced tillage, and careful attention to field hygiene and fruit tree shape. Woodleaf also practices farmscaping: Carl believes that planting beneficial insect habitat and letting the perennial ground cover/living mulch go to flower has been helpful in keeping insect damage in check over time. Woodleaf Farm has a vegetable crop – fruit tree rotation, with vegetable crops usually rotated into areas where fruit trees are removed for 1 to two years. The farm also uses gravity flow irrigation, 100% solar power, low energy use buildings, and cats for gopher control. In 1992, when the Organic Farming Research Foundation launched its first round of competitive grants, Woodleaf farm was awarded a grant to begin studying brown rot control. Since then, the farm has continued to study organic soil management and experiment with nutrient and pest management interactions. In February 2012, Woodleaf farm was recognized with a Steward of Sustainable Agriculture Award, at the 32nd Annual EcoFarm Conference. This entry was posted in Uncategorized by woodleaffarm. Bookmark the permalink. Hi Carl, your Organic Farm looks amazing, I wish everyone could smell the sweet smell of the peaches through these photos. I guess they will just need to visit your farm in person!